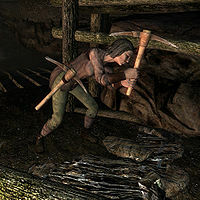 Edith, a Nord miner, is an employee of Leigelf and works in the depths of Quicksilver Mine in Dawnstar. She is incredibly dedicated to her mining duties and can be found hacking away 24 hours a day, without ever eating or sleeping. She is not very talkative and will only say: "Here to mine?" or "Quicksilver ore is rare. Worth digging." when you get near her. She wears a set of miner's clothes and a pair of boots, and is equipped with a pickaxe. She carries a selection of lower-class items and gold. This page was last modified on 12 December 2013, at 21:15.